SHIPPING POLICY - It's simple, you buy it, we ship it anywhere ASAP! We can ship via United Parcel Service (UPS). For orders that weigh less than two pounds, you will find United States Postal Service (USPS) more economical. International customers? No Problem we offer cheap worldwide shipping options! International orders are shipped primarily by USPS. International customers are encouraged to order. See details below. United States Post Office (USPS) International Shipping options information. RETURNS AND CANCELATION POLICY - Not happy, product problems, etc...we will take care of it! 1. All products are sold with a 30 day money back guarantee from date of shipment. Shipping and handling costs are not refundable. 2. Products must be returned undamaged and in good condition. Misuse or damage is not covered. 3. RETURNS :- If you need to return an item, simply login to your account, view the order using the "Complete Orders" link under the My Account menu and click the Return Item(s) button. We'll notify you via e-mail of your refund once we've received and processed the returned item. 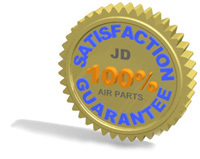 If you are unable to login to your account contact JD Air Parts by Email at jdairparts@gmail.com for a return authorization number and shipping instructions. Please include the original Order Number and Product number issued at time of purchase. 4. CANCELLATIONS :- To cancel an order not yet shipped contact JD Air Parts by Email at jdairparts@gmail.com . Please include the original Order Number and Product number issued at time of purchase.